1/1/03 – We went to Navan, to the second part of The Lord of the Rings, which was nearly three hours long. It proved to be very good. The kids really enjoyed it – Sean thought it was the best movie he’d ever seen. 7/1/03 – I helped the kids with their homework – Sean’s grasp of Irish is still rather poor, and he gets frustrated at this. They are showing some interest in the guitar; Sean played the electric guitar; and Susanna ‘played’ his. 11/1/03 – Sean and I watched the Perpignan–Munster match in the afternoon, which Perpignan won, much to our disappointment. 18/1/03 – [Munster’s ‘miracle match’ against Gloucester] Sean rang [from his granny’s] at half-time and full-time. He was as exhilarated as I was. 27/1/03 – Found a very small field mouse in the hens’ feed, which Sean picked up and freed. 29/1/03 – Pauline took Sean to Virginia Rugby Club for the first time and he had a training session with the under-12s, with a professional coach. He really enjoyed it. 31/1/03 – Sean was on the Knocktemple team in the Credit Union quiz … they finished third. 1/2/03 – Sean and I had a pleasant afternoon in front of the fire, watching Munster beat Neath 37–17 in the Celtic League final – a great result for Munster. Then we had a walk, and then played some football. 3/2/03 – The kids played in the snow; Sean and I made a snowman in the field later. 4/2/03 – Sean and Andy had a ‘nature walk’ up the fields, looking at tracks and so on. 22/2/03 – Sean and I did an ‘open-day’ tour of the secondary school in Oldcastle; Pauline arrived too. We spoke to several teachers and looked at the facilities. Sean had a game of basketball. He very much likes the school and has decided that he wants to go there. 27/2/03 – Sean, Pauline and I went to Virginia Vocational School, which was having an open night. We had a look around, enrolled Sean, spoke to teachers, etc. We were all quite impressed – the school is overcrowded but a large extension will be in place by September 2004. So no final decision has yet been made between Virginia and Oldcastle. 8/3/03 – Sean had been planning to go to hurling and Gaelic football training, but changed his mind – he wants to concentrate on rugby. 11/3/03 – Sean and I watched Arsenal v. Roma – a 1–1 draw that disappointed Sean. 13/3/03 – After school we took Sean and Susanna to Virginia and bought a mobile phone for each of them – these came out of Susanna’s money, and ultimately out of Sean’s as well. They are very excited about their new phones, though they are not properly up and running yet. 15/3/03 – I set Sean up to paint Susanna’s playhouse – he painted three-quarters of it and then felt queasy (having felt queasy earlier); I finished it … Sean went to Andy’s – he, Andy and AJ dressed in army uniforms and had a campfire. Sean ended up having a sleepover there. 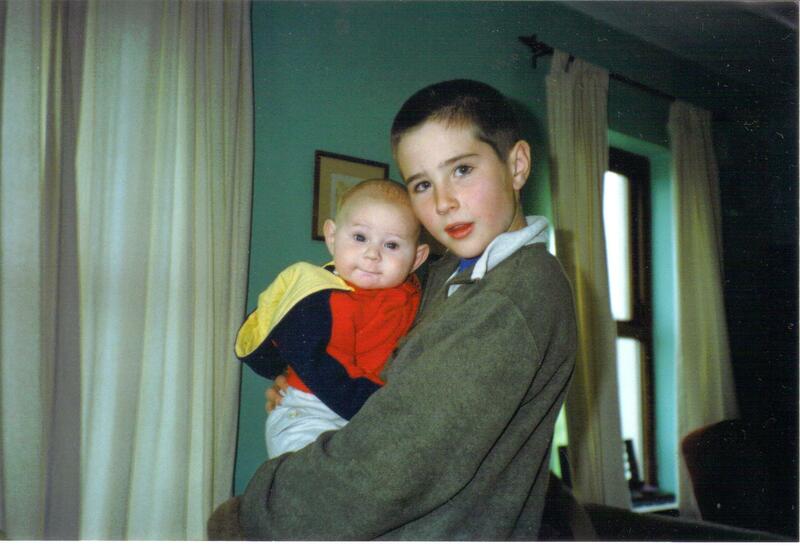 16/3/03 – Sean came home at 9.30, and I drove him to rugby training … Some under-12s and under-14s had been training together, and Sean had had a great time, as usual. He is full of praise for the trainer, Malachy. 19/3/03 – Sean and I watched Arsenal lose to Valencia – they’re out of the Champions League, to Sean’s chagrin. 21/3/03 – We got the kids out to school – Sean, Susanna and Amy all cycled. Pauline brought their schoolbags in the car. The beautiful weather is continuing. 22/3/03 – Sean, Pauline and I watched the Wales–Ireland match. It had an extraordinarily tense finish, as Ireland went behind in injury time but still won 25–24. Sean and I kicked a rugby ball about in the field. 2/4/03 – I played football with Sean and Andy on the lawn – Sean hurt his knee by diving on a stone. 13/4/03 – Sean and I watched Arsenal beat Sheffield Utd in the FA Cup semi-final. We then watched Munster beat Leicester 20–7 in the Heineken Cup quarter-final. This was one of the great Munster occasions – a fantastic performance and victory. We were hoarse from shouting at the television. Snippets of a happy life. Yes, Shermeen … thank you. I’ve been out all day; otherwise I would have approved your comment sooner!